I wake these days to an alarm on my tablet, so as I swipe to dismiss it, the first thing I see are the headlines that came in overnight. This means I awake these days to an alarm saying Wake Up and a string of news notifications saying Stay Woke. First there was the tragedy of Alton Sterling in Baton Rouge, then the heartbreak of Philando Castile in Minneapolis, and now the outrage of five dead police officers in Dallas. Each of these deaths is senseless and unjustified: no one should be gunned down for selling bootleg CDs, driving with a busted taillight, or being a cop. Our polarized world and the news outlets that reflect it see reality in terms of opposites: those who are with us and those who are against. According to this worldview, you’re either pro-white or pro-black, pro-protester or pro-police, pro-gun or pro-gun-control. But from where I sit, heartbroken by the whole sad story, the only thing I decry is hatred and violence, no matter where it comes from. I believe in the power of peaceful protest: the civil disobedience outlined by Thoreau and perfected by both Gandhi and King is just as mighty as any gun. And I believe it’s possible to both support the police and condemn police brutality. What I see in the tragic footage of both Alton Sterling and Philando Castile are officers who have failed to execute their most important duty, which is to protect citizens by deescalating tense situations. What I see in these videos isn’t proper policing but a catastrophic failure to do a difficult and underappreciated job. If the Dallas sniper was motivated by his outrage over recent police killings–if he truly believed that Black Lives Matter–the sad consequence of his violence is this: one day after everyone was focused on the lives of Alton Sterling and Philando Castile, honoring their memory by grappling with difficult questions of race and social justice, today those two tragedies have been overshadowed. Goaded by news outlets that seem incapable of covering two separate stories simultaneously, especially if that coverage demands a nuanced balance between opposing extremes, our collective consciousness has moved on. Today, if you pause to remember Sterling and Castile, you’re seen as being insensitive to the police lives that were lost. Instead of drawing further attention to the serious problems of implicit bias and police brutality, the Dallas sniper has pushed the news cycle onto other issues. Black lives still matter, and so do the lives of cops: we have to cultivate a mindset that sees these two statements as being equally true, not opposed. In Korean Buddhism, the bodhisattva of compassion is named Kwan Seum Bosal, a name that means “She who hears the cries of the world.” In Buddhist iconography, Kwan Seum Bosal is sometimes depicted as having eleven heads and one thousand eyes and hands: each eye and ear focused on the world’s suffering, and each hand ready to help. Because of all her eyes and ears, Kwan Seum Bosal can simultaneously hear the cries of black men dying in the street, the cries of police officers killed in the line of duty, and the cries of all the family, friends, and strangers who mourn. Because of all her eyes and ears, Kwan Seum Bosal is heartbroken every time she reads the news, her thousand hands wiping tears not just in Baton Rouge, Minneapolis, and Dallas, but also Orlando, Istanbul, Baghdad, Mecca, and Bangladesh. Every morning when Kwan Seum Bosal opens her thousand eyes, she sees suffering in our sad, sorry world, and every time she turns her eleven heads, all her ears are full of our wailing cries. Kwan Seum Bosal has one thousand hands to caress and cradle all the brokenhearted, and the arms of Jesus are equally wide. There is no shortage of heartbreak these days, so we must respond at every turn with an abundant outpouring of compassion, hope, and love. 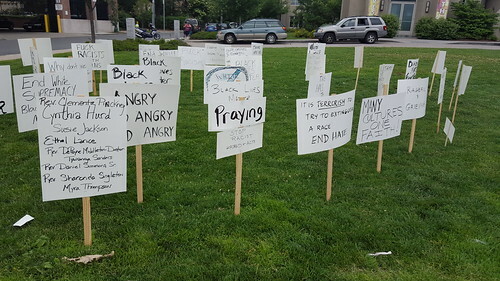 The photos illustrating today’s post show a Black Lives Matter display set up in front of the First Baptist Church in Jamaica Plain in June, 2015, in the aftermath of the Charleston church shootings. Sadly, “news” of violence and hatred isn’t “new” at all. however this article opened my eyes, the inferno was a political tract set in a very violent environment, dante himself was tortured at one point ! suddenly the inferno makes sense ! shakespeare is another author i was out of sympathy with, then coming across brenda james’s discovery of sir henry neville as the real author it all opens up ! different times have different points of softness and hardness, today’s hardness is other sorts of crucifixion ! but from a zen or mystical point of view its all mutation ? I’ve seen some translate this as “Observing the Sounds of the World,” but in a Buddhist context, there’s nothing wrong with “Hearing the World’s Cries,” since that’s basically the function of this divinity. I think of Gwan-eum bosal whenever I see that scene in “Superman Returns” in which Superman tells Lois that he hears every single cry of despair and anguish. If only such a being really existed… but I suppose that that being is us.